Turin Epicurean Capital: lots of kisses! let's face it: just 1 tin of kisses isn't enough! Lady's Kisses are basically two sand-like cookies sandwiching high quality dark chocolate. 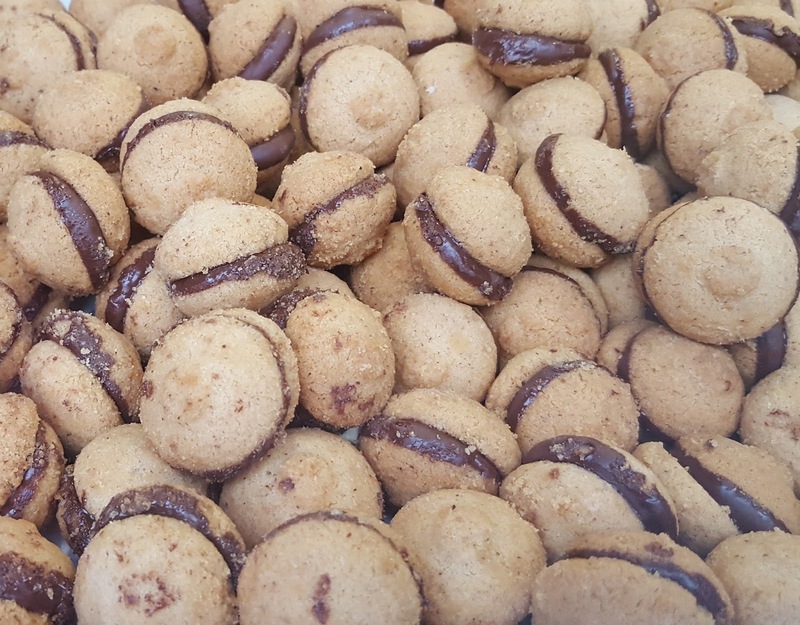 Baci were invented in Tortona, a town in the Alessandria area that is also famous for Montebore cheese and Timorasso wine. 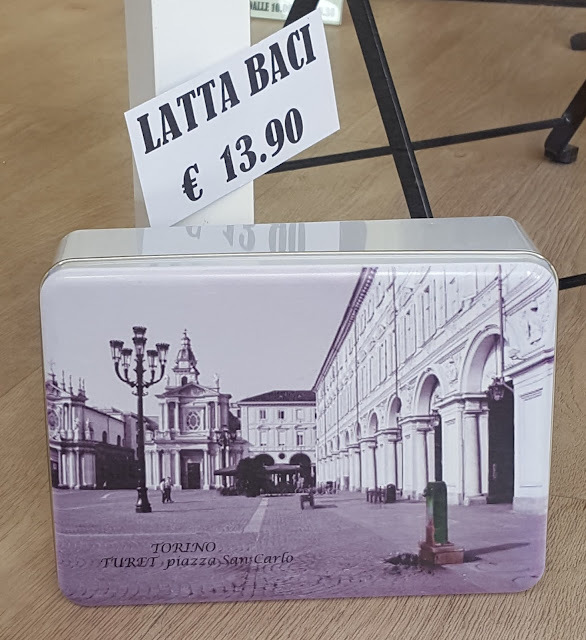 When you visit Tortona on your way to the riviera you will see how many local pastry shops are still making baci according to the original 19th century recipe when these cookies were invented. Originally the recipe called for the local "round and gentle hazelnuts" produced in the many hazelnut groves of Piedmont as they were cheaper and easier to find, but in 1810 the recipe was modified and our lovely local hazelnuts got replaced by almonds. These baci made with almond meal were called "golden kisses" or baci dorati and they won the gold medal in 1906 at the Milan Fair. According to the legend though, baci were invented by King Emmanuel III's royal chef in 1852 to answer his cravings for a new sweet. The chef mixed all the basic ingredients he had in his kitchen and came up with baci. The king loved them so much and from his court in Turin they quickly spread all over Europe. First of all, get the butter out of the fridge and cut it into cubes to allow them to get to room temperature. If you have whole nuts, grind them in your mixer or save half for chopping to add texture of the cookies. The original cookies are sandy so these cookies are not supposed to be crunchy but we like to vary every once in a while. By hand or in the mixer, combine the flour and the sugar to the hazelnut meal. Mix well. By hand, add the softened butter and mix till getting a uniform ball. Roll it slightly down, wrap it in saran wrap and let it rest in the fridge for about 1h. Get your cooled cookie dough out, line the cookie sheet and hand roll tiny balls of cookie dough. They should be the size of a peach pit. Bake for 20/30minutes circa depending on your oven. When the baci are ready they are golden. If you have a good quality cocoa powder at hand, add 2 tablespoons to the cookie dough to make them chocolaty. For an extra touch: sprinkle baci with powered sugar or vanilla sugar. Naturally, baci are an amazing snack, you can enjoy them with tea, milk, coffee, hot chocolate, gelato, wine, virtually anything you like! Baci will finish very quickly but in case you bake for an army, keep them in a tin for about 4-5 days. If you make them, please, take a picture and post it online mentioning @turinepi on Facebook, Instagram and/or Twitter. This and other traditional recipes are offered in our vidaroyal cooking classes in Turin.